KCPuppetree presents "Quwi and Zorro. A Peruvian Tale." Atelier Gallery presents Puppets Night Out, a regular puppet series for kids of all ages. KCPuppetree is excited to join Atelier Gallery every third Saturday of the month. 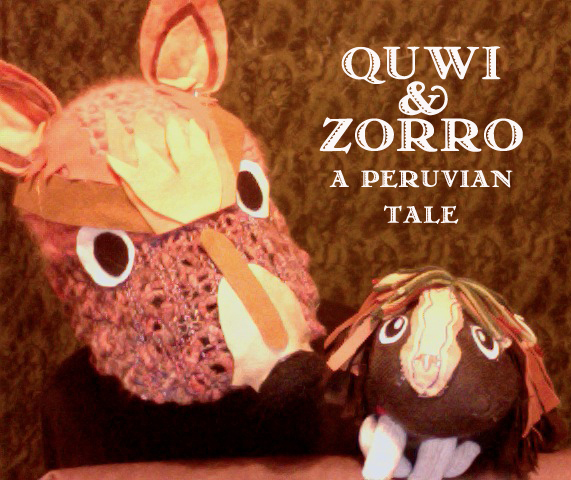 For their first performance, KCPuppetree presents Quwi and Zorro: a Peruvian Tale, a puppet play about a clever guinea pig, Quwi, and a not so clever fox, Zorro. This silly puppet show features hat puppets, sock puppets, audience participation, and musical accompaniment. KC and musician Robert Randall, recently traveled to Peru with Grace Art Institute, where they taught music and puppetry to local children and performed this same show at a school called Casa Chapi. We are excited to bring this fun interactive play to children in Portland and share stories of our Peruvian adventure. After the show we will feature a video from our work in Peru and tell silly tales about other silly kids. We will also invite the audience to try on a puppet hat themselves and even send pictures back to the children of Casa Chapi.